Smoke and Mirrors: Who Says You Must Be Super Wealthy To Ride Out the Apocalypse? Who Says You Must Be Super Wealthy To Ride Out the Apocalypse? "If you're determined to live through any possible doomsday scenario, the thought of climbing into one of those deep underground shelters might give you pause. After all, who wants to live dormitory style with a bunch of strangers when you've become accustomed to the comforts of your own double-wide at the RV park? 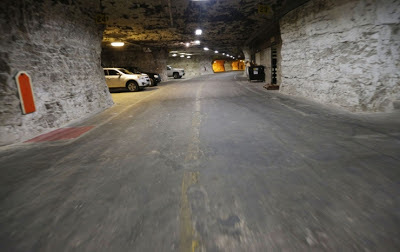 Dug over 100 years ago as part of a limestone mining operation, this bunker in Kansas covers 45 acres sitting 100-150 feet below ground. Developer Robert Vicino says that the structure can withstand a 1 megaton nuclear blast just 10 miles away, but there's no word on how many apocalyptic zombies the doors can hold back. The temperature inside hangs constantly in the low 70s, so it should be fairly comfortable as you wait for things to settle down up on the surface. The shelter is being built by the same Vivos folks who gave us that missile silo bunker for the super rich. The difference here is that bunker is much larger, allowing you to move in complete with your own portable home. As with most RV parks, the costs are somewhat lower too at $1,000 per linear foot for the RV space plus $1,500 per person for food. That means a family of four with a 30-foot rig could move in for $36,000, a whole lot less than the $170,000 you would need to get into the Indiana silo bunker. Once it's fully developed and sold (sorry, cash only), participants will be encouraged to spend their vacations at the facility to familiarize themselves with underground bunker living. Sounds like fun to me.